Interesting things can happen when you have pictures within pictures. Not so much, for example, with an everyday photo of an art gallery, if all the pictures are behaving well and staying in their frames. But sometimes it’s not possible to tell when the picture of a picture ends, and the picture of the real world begins. Here’s an example, in which the paintings in an art gallery are definitely not behaving how paintings should. M.C.Escher did some brilliant pictures in which the boundary between the real world and the graphic world breaks down in the same way. The most famous is his print Drawing Hands of 1948, but you’ll find lots of others. Amongst contemporary artists, Rob Gonsalves has done some really clever paintings, such as Unfinished Puzzle. It’s the kind of issue that interested Picasso and Braque too, in their cubist paintings. In one by Braque you can see a cubist palette hanging on an illusionistic nail. 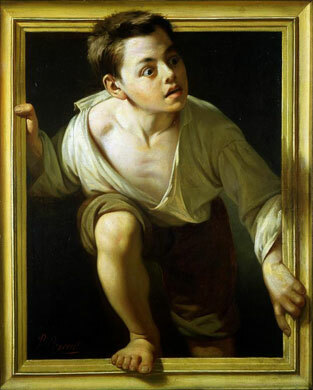 Here’s another famous example, a painting from a bit over a century ago, by Pere Borrell del Caso. It’s called Escaping Criticism. I guess the artist felt hard done by at the hands of critics, and did this as a demonstration of virtuosity. (I believe the original painting is in the Banco de Espana Madrid – Spain’s national bank). The guys climbing back into a painting in my image are borrowed from a copy of Michelangelo’s lost study for the Battle of Cascino. The shipwreck is from a 200 year old painting by English Romantic painter J.M.W.Turner in the art museum Tate Britain in London, of a bad day in the English Channel. 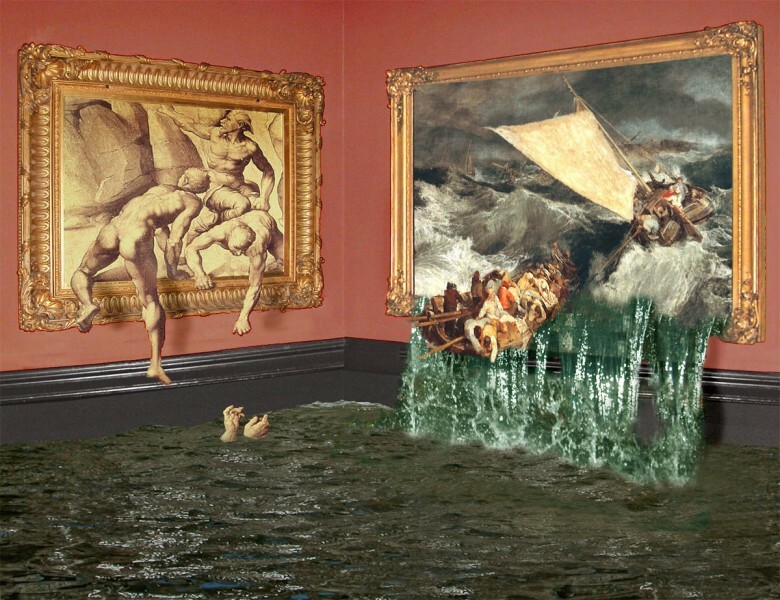 I would love to have a large poster or print of Bad Day in the Art Museum. It’s wonderful! Are any for sale? Hi Lori, thanks for that. I’m not sure this image will bear much enlargement, but I’ve had a go, and it’s now available as a 20 x 16 poster at http://www.Cafepress.com/optoct. I must say that the sharpness of the image will not be as good as I would like it to be, but I think it’ll work as a poster OK.
Hi Daniella, yes, please use the image, and the short answer to how it’s done is just Photoshop … but I’ll email you some more detail.